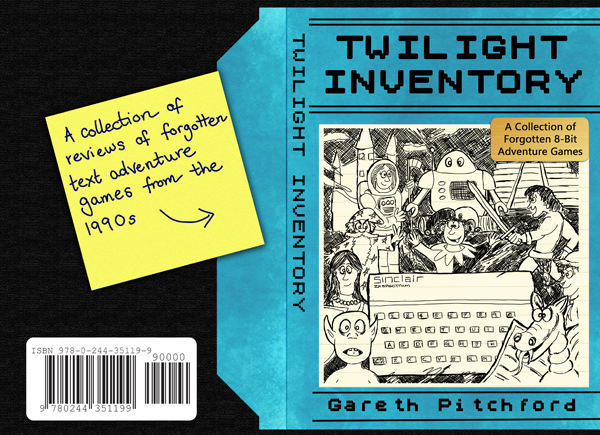 Twilight Inventory is a collection of reviews of forgotten text adventure games from the 1990s. Created by enthusiastic amateurs, during the last days of the 8-bit computers, these home-grown titles forsook the flashy graphics of commercial arcade game experiences, concentrating instead on devious puzzles, descriptive text and interesting stories. Taking inspiration from folklore, legends, films and books, these were games with tales and settings unvisited in mainstream titles both back then and now. Featuring contemporary reviews and additional background information, this book is designed to give the reader a flavour of the small, but vibrant and flourishing, British adventure game scene of the early 1990s. A time when companies such as Zenobi Software, Compass, River, Tartan and FSF Adventures, kept a loyal community supplied with unique experiences, delivered through the postal system in a protective Jiffy bag. Check Lulu's Twitter or Blog first... they usually have a discount code! Please note this file remains ©G. Pitchford and may not be distributed elsewhere.